When it comes to a practical and scalable solution for the small and mid-size company to scale, many systems boast a great pre-sales to post -sale integration and management of online inventory management features, such as Products, Price Books, Vendors, Sales Quotes, Orders, and Invoices with the Sales related modules such as Leads, Accounts & Contacts, and Opportunities. But where almost all of the CRM packages fall short is how they can be automated and integrated with the data that your big customers will be sending you, and asking you to send to them, in a variety of formats. For anyone who has worked on integrating an order management package to an accounting package internally can understand the complexity and work involved to integrate multiple organizations. There is an entire industry built on doing just that. EDI, which stands for Electronic Data Interchange, is a tight industry which professionals spend their entire career specializing in the integration and automation of transactions between businesses. It is a specialized field which order management, CRM, and ERP providers only provide the hooks and leave the actual communication, transformation and integration to the EDI professionals. You will find many eCommerce type companies that offer the catalog and shopping cart experience. This is fine for end consumers and really small one-off business orders. But those large customers and buyers have their own automated system and are not going to visit a vendor's shopping cart portal. They want the supplier to comply with their own EDI specs. That is when most newbies to EDI begin their quick evaluation of the EDI market. It begins with a Google search, then they realize that there is an entire industry, a whole new set of acronyms, a whole new language, then they realize they need a professional recommendation. Small business owners may start by asking their customer, "who are some providers that have worked well for other like size companies"? They may then ask their CRM/ERP/Account package provider, "what EDI systems seem to work well and integrate"? Then they may look to who their competitors and other industry company providers use or may ask their IT consulting partner who they might have worked with in the past. - What is driving the evaluation - a customer asking? - What is the business process? Order-to-cash, Logistics, healthcare, energy? - Who are the trading partners? - What industries do you typically trade? - Who are your trading partners? Buyers, suppliers, logistics, 3rd party? - What are the transactions? - What are the volumes of transactions? - What is the growth need of electronic business? A one off or a growing segment of the business? The answers to the above questions are what a provider really needs to understand in order to lead the prospective client down a solution path. For the user and prospective client there are three fundamental points to evaluate and measure upon. They are (1) Reliability - how can I make sure that I'm going to get these transactions, and they are going to get and be able to process my transactions? (2) Customer Support - the user needs access to an EDI pro that if something does not work, they will be able to make it work. And (3) Cost = Price + other costs. What is the lowest total implemented and on-going cost of ownership? That is it. The rest of the features should be entirely preference based. - ERP and industry based providers - providers that specialize in applications and requirements of a certain industry of trading partners. 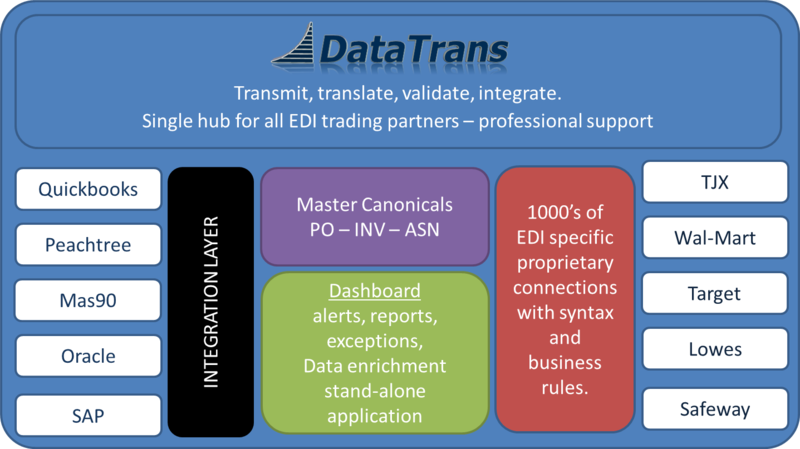 One example of how an EDI provider might optimize an approach is DataTrans. DataTrans solutions are optimized for small and mid-size suppliers to the retail industry which needs a low cost start-up with an option to quickly scale with the business. See the image below of the multi-tenant EDI platform. There is a 20 question survey tool and RFQ builder that can assist a new user in aligning their needs, preparing the right questions and identifying potential providers. You can find the survey in the left toolbar titled ‘Survey' or by clicking here.